Low-wage workers in the tens of thousands, in 263 cities and towns, went on strike from coast to coast on April 15 for $15 an hour and union representation without retaliation. It signaled a growing escalation in the workers’ struggle in the U.S. Joined by protests in 40 countries on five continents — from San Paulo, Brazil, to Seoul; Amsterdam to Auckland, New Zealand; Toronto to Tokyo — April 15 represents an emerging global movement against low wages. Nothing like this upsurge of working-class protest has been seen in the U.S. since the national May Day demonstration in 2006, led by thousands of migrants from many nations. Organizers deliberately called the nationwide protest on April 15, Tax Day, to emphasize that taxpayers subsidize mega-billion-dollar imperialist giants like McDonald’s and Walmart that pay workers poverty wages. A study, released April 13 by the Labor Center at the University of California Berkeley, reports $153 billion for such public assistance as food stamps, Medicaid and housing subsidies is needed to sustain underpaid working families. A report by the National Employment Law Project, also released April 13, found nearly half the U.S. workforce (42 percent) makes less than $15 an hour. Women and people of color are disproportionately represented in the underpaid workforce, with over 50 percent of African-American workers and nearly 60 percent of Latino workers making less than $15. Workers in the fast food industry started this struggle two and a half years ago. This time other sectors were also on board with walkouts, marches, rallies and die-ins, from Atlanta to Los Angeles. 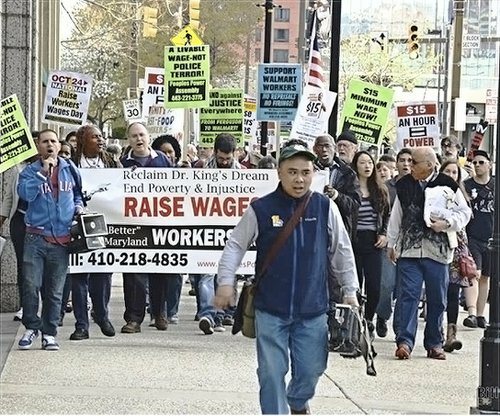 In addition to members of community and faith-based groups and unionized workers proudly showing solidarity, three new groups came out for the first time: workers in other low-wage jobs, activists in the Black Lives Matter movement and students. Legions of underpaid, unorganized home care and child care workers, car washers, adjunct and graduate student teachers, retail and dollar store clerks, unorganized construction laborers, airport service and laundry workers, and all kinds of part-time, temporary and contract workers joined the Fight for $15. African-American youth linked the Black Lives Matter movement to the low-wage struggle. A banner headline on the Facebook page of Fast Food Forward proclaims: “Economic justice is racial justice.” Dramatic links were made when early-morning demonstrators in Brooklyn, N.Y., picketed a McDonald’s wearing T-shirts reading, “I can’t breathe, Fight for $15.” And a die-in was staged at noon in front of a McDonald’s on the Upper West Side of Manhattan for four minutes and 15 seconds — to symbolize the struggle. After demonstrating in Memphis, more than 200 workers and students, joined by forces from Little Rock, Tenn., boarded chartered buses and several small vans for the five-hour drive to join the Fight for $15 action in Ferguson, Mo. College and university students came out in droves, driven by the burden of student loans and foreseeing a debt-ridden future. “It’s important for students to be involved,” said Robert Ascherman, a student activist from New York University, “because even if we aren’t working for McDonald’s or Walmart, we are still on McDonald’s or Walmart type of wages.” Even now, some students have to choose between buying food or buying textbooks. Even the Wall Street Journal, the ruling-class mouthpiece, ran an article April 15 stating that though $15 an hour for fast food workers “seems a real stretch” … [it] “may not be such a reach,” citing cities like Seattle and San Francisco where workers are now making $15 an hour and noting struggles in many cities and states to boost their minimum wage. The working-class genie that popped out of the capitalist bottle on April 15 — asserting the collective might of a determined working class — cannot be shoved back into that bottle.